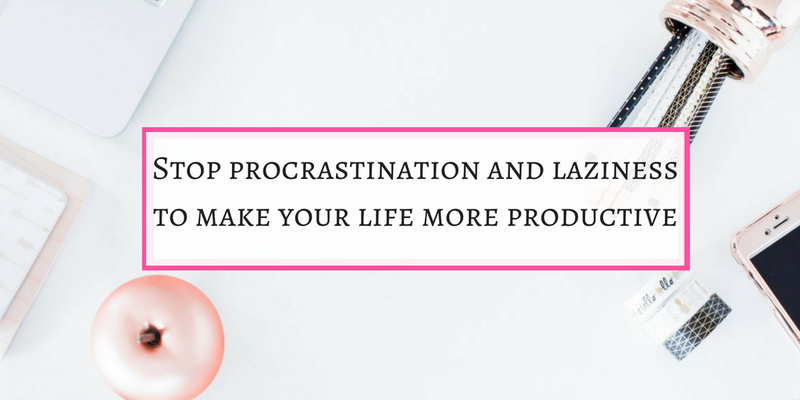 It is important to stop procrastination and laziness because it does not only effects you financially or professionally , but personally too. It can have adverse effects on your health, married life, your children and other people around you. Most of us procrastinate on one or other time. But if it becomes chronic, it effects badly. Words like get motivation and think good about your task will not get anything done, but taking action will. Even if you take small steps at one time, it will help you in finding out ways for resolving your procrastinating habit. It is best to know immediately that you are procrastinating. And work towards eliminating that habit. I always remember during college days. We always had two days off between exams during majors. And I always waited for the last day to prepare for exam. And then everything would become so overwhelming that I would shut books and go to sleep. I was lucky that I got marks in those exams but it was dangerous thing to do for studies. Knowing what are you doing and how you are doing will give you better understanding of your habits. You will be able to come out of procrastination only if you know it. I remember once I heard somebody saying to the other person, “oh yes, you are always very busy, Busy without work “. This was way back in college. But I can think of that term now, as being the best situation to describe procrastination. You seems to be very busy but you don’t accomplish anything. You are not even sitting and enjoying your own company. But you are busy. This is the best time to recognize ‘ yes you are procrastinating ‘. You have so many things to do in your daily lives, but some of those are most important tasks to do, which you are putting off. Grab those tasks, align them according to their priority and start working on them. I always procrastinate taking my medicines. Though that is the most important thing. Now I write it on as a priority on my working board in front of me. Some of the small tasks take lot of energy from your mind if you don’t complete them. They start building up in your mind and becomes a big hurdle for other important tasks. Have you ever noticed how many times you came across that bill while checking your email but you always leave it for next time. And then whenever you have to start something important, that bill will come into your thoughts again. It will again divert your mind, waste some and you will put it off for some other time. Best option is to pay the bill online if you can , get rid of it and move on to your most important task. This is the most important step if you want to beat procrastination. There is no pill that can let you start working but taking action is really therapeutic in terms of procrastination. Starting your work will take you towards accomplishment. But if you will not start working and take action , you will miss the boat. Once you will start something, you will definitely accomplish it. ‘ Take action Now ‘. Eisenhower matrix is a time management technique which divides your tasks into four quadrants. This could also be applied to procrastination habit. 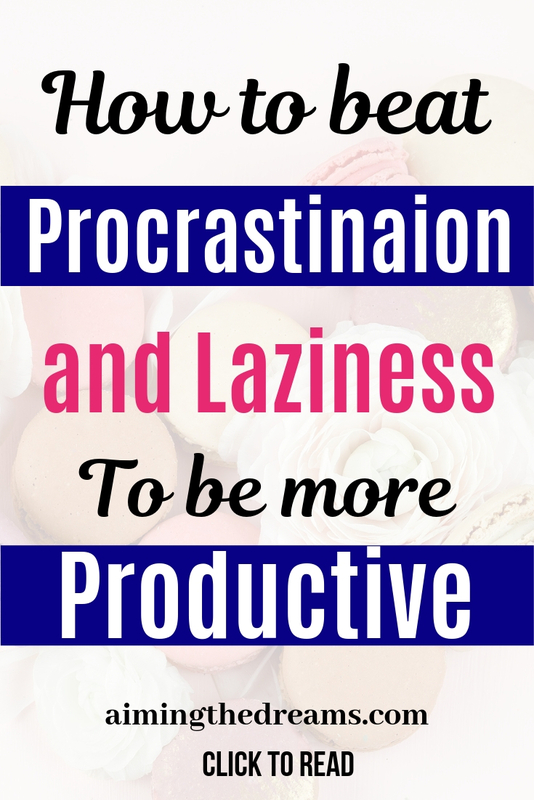 As you know procrastination stems from too many tasks and you feel uninspired to do any. But when you divide your tasks according to their urgency and importance, you will basically become more productive. Now you know where you need to take action immediately. And you can assign time to your tasks. Yes motivation is a big buzzword. But it is also a big reality of our psychology. There are some moments when you really feel motivated to do something.This is the time to seal the motivation. Because it will vanish and your mind will again come to its original comfort zone. At this moment, write down for what you are feeling motivated and start with a headline for your project or task. Put a reminder to work on that. Make a strategy to complete that task. Recently I was watching a show , Australia’s first Ninja warrior. I cannot give a small jump but when I saw those incredible people doing all kind of stunts, I wanted to the same. I don’t have words to explain. I can never do that I know but I was motivated at that time. But I made a promise and have written on my daily board that I will walk for 30 minutes daily. Even now I have 1000 excuses not to do that. But somehow I manage to do. There are so many tasks which are not important and our lives could be fine without them, delete them from your routines. Could be watching television. Checking your emails many times a day. Or something else. You have to figure out yourself. If you don’t need those particular tasks in your life, delete them. Make your working habits and schedule as clutter free as possible. If you feel like you are procrastinating on a particular task but you can get it done by delegating to somebody, just do it. Siting on that and doing nothing but thinking about that task and feeling bad will not do any good. Better get it done. Because unfinished tasks take space in brain and grow big . You just goon thinking about them. 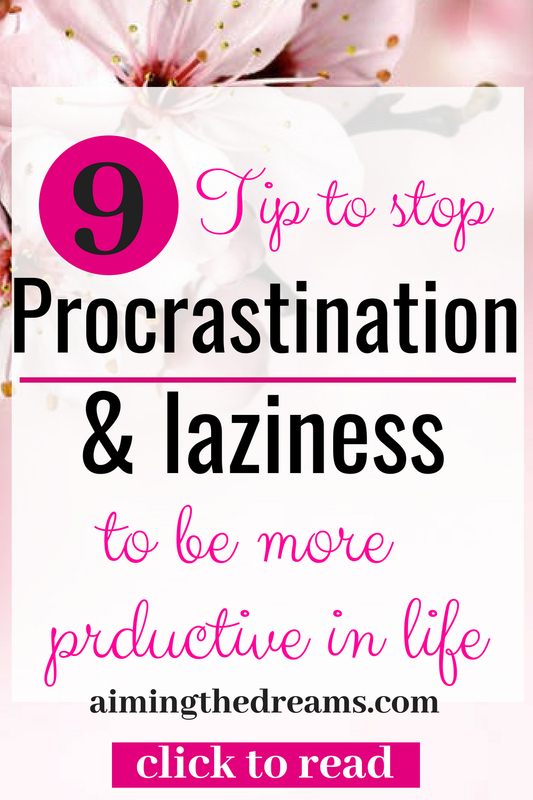 This will make it difficult to stop procrastination and laziness. Whenever you will be sitting to do some important task,that small task will come into your mind. It means your attention gets diverted from most important to a small task. Better complete that first and dont let it take your energy further. Frencesco Cirrilo recognized that humans can concentrate for only short period of time on any task. So he created a time blocking system where you can block your time for any task and work on that uninterrupted. After 25 minutes, you would have completed nice amount of hardest task. When you see this, you can now focus on the bigger task once more. Promodoro technique is the world renowned technique to be more productive by blocking your time. This one is my favorite. I use this because it reminds me of school lectures which were always of 30 minutes. And I think there was some reason behind that. When you see your big dream, you feel motivated to achieve. But when you actually have to do it, you start procrastinating it. Here it would be in your best interest to break that goal into smaller chunks. Get those tasks done with 15 to 20 minutes frequency. 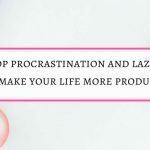 You will be amazed with your own productivity. There are many tools which helps in making you more productive. But these tools only help you, the most important thing is you. You can only help your self out of these things. Make a decision and start working. How you like to beat procrastination, please tell me in comments. Share this post if you like. I’m all about #2 – I like to nip things in the bud right away so I don’t stress things 🙂 Great list! Hey Kristin,thank you for reading and commenting on this post. I am so glad and happy to see your comment.